UAL has teamed up with VICE to screen a powerful new documentary about the rise of teen abuse of Xanax in the UK. 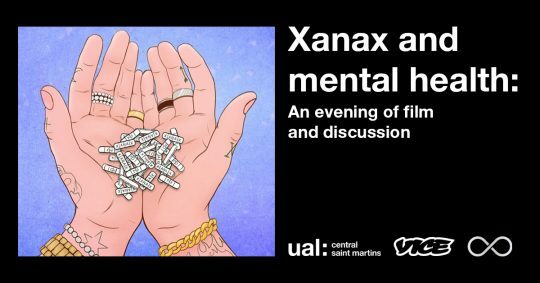 Set to launch on 15 March at UAL’s Central Saint Martins, the film explores how Xanax use among UK teenagers in on the increase. Following an in-depth investigation, VICE journalist Hannah Ewens speaks to the current generation of anxious teenagers obsessed with Xanax culture, reformed addicts, dealers selling the bars on social media and UK rappers to uncover why the prescription drug has become so popular. The film questions the age-old argument of blaming artists for drug culture or looking at whether there is a more serious issue with mental health among young people in the UK? 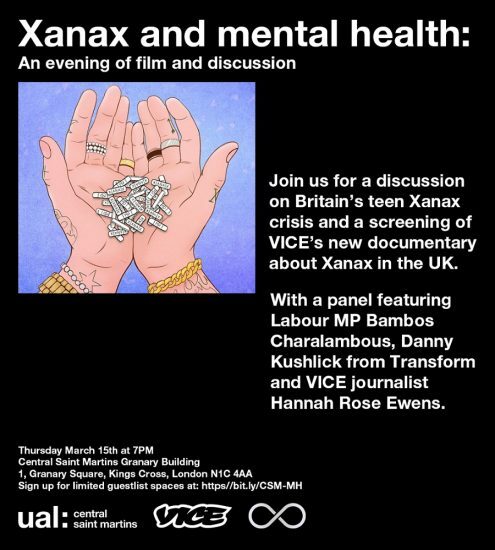 A panel discussion, comprising of Labour MP Bambos Charalambous (who started the first debate about xanax in the House of Commons in January this year) Danny Kushlick of NGO Transform and Emily – a teen user of Xanax who appears in the documentary, will follow the screening. Inviting questions from the audience, the panel will tackle the rise and prominence of Xanax in the UK market and its links to popular culture. It will explore the dangers of the drug and whether mental health support for young people is failing in the UK? It is an issue that UAL has taken seriously, noting the significant and growing mental health problem within the student community worldwide. LGBTQ+ students and those from BAME backgrounds face an increased risk of poor mental health, with research showing that 48% of transgender people under 26 have attempted suicide. Students, parents, teachers and all those interested in learning about the growing abuse of Xanax and the link between mental health and young people are encouraged to attend. FREE. Places limited. Book here. UAL – For information on help and support available at UAL, visit the Student Services webpage on the UAL website. VICE – For more information about VICE’s harm reduction campaign launched last summer in partnership with The Loop and The Royal Society of Public Health. For more information on Safe Sesh online hub.